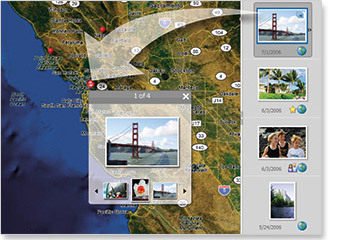 Relive memories by viewing and sharing your photos displayed on an interactive map in the exact locations where they were taken (works with United States addresses only). An address-based georeferencing tool? Why? And why just US addresses? Sorry, but that’s not good enough. PSE5 should also map EXIF-based coordinate data, let you georeference globally by navigating to a spot visually, and allow you to export photos as EXIF or KML (much as Picasa 2.5 beta does). Maybe PSE5 does all these things, but if so they’re not telling. The big picture here is that Picasa has a natural advantage when it comes to georeferencing because it can call on Google’s superior geospatial dataset. I think Adobe (and Apple with iPhoto) would do better to focus on a plugin system that lets us users choose (or build) their own georeferencing tool (and also photo sharing service). Use Flickr? Picasa Web albums? Panoramio? Why not edit photos in PSE5 but share them with a tool of choice? If Adobe is serious about entering the photo georeferencing and sharing game, they need to realize that there are better free solutions out there right now than what they’re advertising for $90. Nice article, and I agree with you about the geotagging, useless. I live in the UK and a simple click where the photo was taken with some zoom functionality would suit me fine!